1. Seven people have been killed shot dead by the Israeli army, or because of serious injuries. Three of them are from Jerusalem, one from the West Bank and three from Gaza. Ishac Badran, (16), was shot dead by Israeli Police officers in al-Mesrarah neighborhood, in Jerusalem and then left bleeding to death; Mohammed Sa'id Mohammed Ali (19), from Shu'fat refugee camp, shot dead near Damascus Gate in Jerusalem, Ahmad Jamal Salah, (19) also from Shu’fat refugee camp, Jerusalem, and Ibrahim Awad, (28) from Beit Ommar, near Hebron. Furthermore, in Gaza Strip Jihad Al-Abaid (21) who died after being seriously injured by Israel Security Forces in Deir al-Balah; Marwan Hisham Al-Barbakh (13) and Khalil Omar Osman (15) were killed in Khan Kounis. 2. 618 civilians have been wounded and injured in West Bank and Gaza Strip, of whom 586 citizens are from the West Bank; casualties were caused by different means, including: 26 by live ammunition, 148 by rubber-coated metal bullets, 408 due to suffocation gas and 4 assaulted. On the other hand, there have been 32 casualties in the Gaza Strip, 7 with live ammunition, 21 suffocated and 4 assaulted. 3. 4 Journalist have been injured with rubber coated metal bullets: the rise of Israeli attacks on the Palestinian press has focused in particular on those journalists and media crews who operates in the occupied city of Jerusalem during the coverage of settler incursions. Mona Qawasmi, from Q-Press news center, has been shot with a coated metal bullet in the shoulder during the coverage of the clashes in the Shu’fat refugee camp; the Occupation Forces attacked the press crew of “Palestine today” channel while they were trying to cover the shooting of the martyr Isaac Badran in Jerusalem. Essam Rimawi, an independent photographer has been injured by a coated metal bullet in the leg while he was covering clashes in Bet-el, north of Albeareh. The Israeli forces had also attacked the crew of “Palestine today”, injuring the broadcast engineer Joudeh Abu Nejmeh by a rubber bullet in the foot while they were covering clashes in Yatta, Hebron. 4. Persistent raids and mass arrests of young Palestinians are being carried out in various villages and camps. 59 youth arrested just last night. 5. Continuing confrontations with the occupation forces starting in the afternoon and lasting until midnight took place in some 50 sites in the West Bank and Gaza Strip and in 17 sites in 1948 Occupied Palestine. Confrontations included throwing stones and Molotov cocktails, along with the chanting and singing. 6. 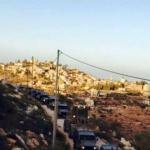 Daily clashes with settlers occurs in the axes of the main roads at the entrances to villages near the incident Hagai and Qeryat arba’ in Hebron, Efrat settlement south of Bethlehem. 50 confrontations points in the West Bank and Gaza Strip and 17 points in the occupied Palestine in 1948 Occupied Palestine, as follows: In Jerusalem clashes were concentrated at the Damascus Gate, Sur Baher, Sheikh Jarrah, in Shu'fat refugee camp, in Al- Masrarah, the old town of Anata, Ram, Qalandia refugee camp, Abu Dis, Issawiya, Silwan and the Mount of olives. In Hebron clashes were in Beit-Ommar, Halhul bridge, around the Hagai settlement, Safa, Mount Jawhar, Kriat Arba settlement, Abu Sneineh, Kharsa, Atabaqa, Yatta, Al-Aroub refugee camp, Alcarentina, Ziv Junction, Bab Azawyeh, Surif, Al Kasara, Al Aroub refugee camp. In Tulkarem clashed around Geshori industrial zone. In Ramallah, the area around the Beit-Eil settlement Jalazoun Refugee Camp and Aboud. In Bethlehem, Al-Khadr, Nahaleen, Aida refugee camp and south of Bethlehem. In Nablus Jaload, Yanon and Hawarah. In Jenin, Zboba, Rommana, Salem military camp and Barta'a. In Qalqilya, Kufr Qaddum, Krneah Shomron settlement. In Gaza Strip, confrontations took place in Beit Hanoun, Nahal Oz, Farrahin and Deir al-Balah. Today 10th October, the clashes in 1948 Occupied Palestine had been called in participation to the “Day of Popular Anger”, which was launched in all provinces of the country and the camps of Lebanon. In 1948 occupied Palestine clashes were concentrated in Kufr Qasem, I’bellin, Nazareth, Attaybeh, Baka, Haifa, Kafr Kana, Kafer Qare’, Umm el-Fahm, Ramle, Kafer Manda, the settlement of Ma'alotTarshiha, Tur'an, Afula, Geljulia, Reineh, Beit Hever settlement.